Posted on TrainBoard.com in the Inspection Pit Forum, and copied here for PD Blog reference. 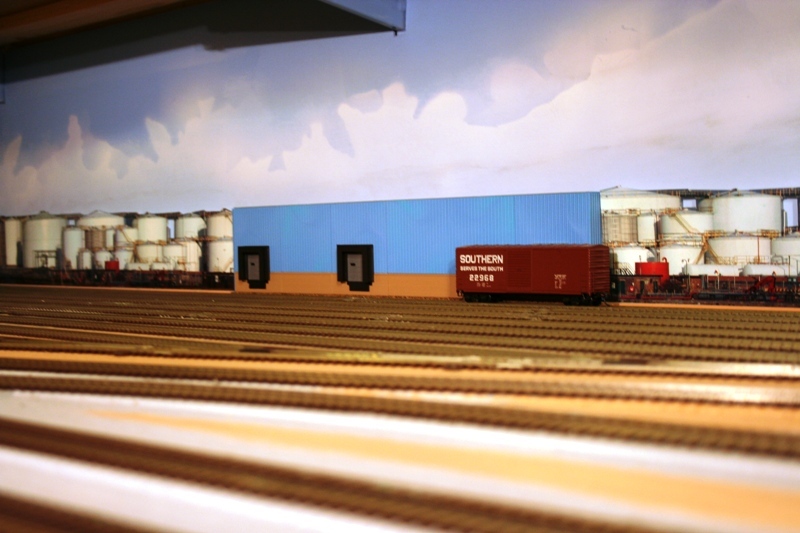 This is a short mini-clinic on how I mount images on foam core board for backdrops on my Piedmont Division HO scale layout. I collect photographs and images from my own collection and from research on the Internet. I have found a few great sources of free images on the Internet that include buildings, structures, landscapes, and industrial subjects that make for good backdrop candidates. So what makes for a good backdrop image? I try to pick images that have as straight an alignment with the front of the subject as possible; it has few shadows, and few if any foreground and obstructing objects such as trees, telephone poles, people or vehicles. Besides my own images that I have taken there are two sources that I have used for free images on the Internet. They are Flickr.com and FreeFoto.com, both have search functions that allow you to find just about any image you want. You just have to sign up for a free account with a valid email address. For example, the tank images that I found for my backdrop behind the staging/freight yard were found in the Business, Industry, Oil Refinery section of FreeFoto.com. (Click that link to view that page.) I also found images of North Carolina buildings by putting in a keyword search such as North Carolina, brick, buildings on Flicker.com. (Click that link to view that page.) Then the search process continues until I find candidate images that might make it to the layout. However, you can use any combination of specific search keywords to find your own images. The materials that I use for building the backdrops includes the inexpensive foam core found at Michael’s or A.C. Moore Arts and Crafts stores, a typical 2’X3’ sheet of 3/16” thick is usually around $1.00 +/- each. Sometimes I have seen them on sale for under a dollar each. I also use 8 ½” X 11” glossy photo papers to print the images from my color photo ink jet printer. The adhesive I use is the 3M 77 spray adhesive for attaching the printed images to the foam core sheets. After I have selected the image I will crop it and resize it with a photo editing software to the dimensions that fit the HO scale scene. For most of my backdrops I am trying to give it a forced perspective of distance. So sizing them to actual HO scale dimensions is not really necessary, I want them to look like they are further away than the actual structures in the foreground on the layout. Once the images are printed out I will take them to the layout room and cut out any sky or sections that will not fit with a sharp blade of my X-acto knife and also use a metal straight edge to assist with making the cuts. Once the outline of the image is cut I will place it on top of the foam core board and then I trace the outline with a #2 pencil. Then I cut out the shape of the image outline from the foam core. I will match up the image to the foam core shape and make a few adjustments here and there to ensure that the foam core is not showing through. Now that I have the foam core cut to how I like it in reference to the image I place it onto a large piece of scrap cardboard and spray it with the 3M 77 adhesive to give it a nice even coat. Allow the 3M 77 adhesive to set up for a minute or two and then gently line up the image and place it on top then I gently press the image and slide it around a bit to fit the cut out shape. I allow this to set up for 5-10 minutes. I then take some painters masking tape and attach a few pieces to the back of the foam core/image and make temporary placements on the Masonite backdrop until I like the way it looks. Then I will Elmer’s Glue to make the permanent placements of the foam core to the backdrop.